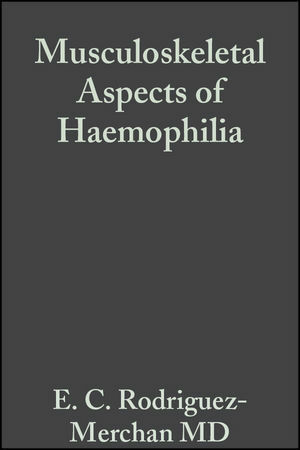 Edited by two leading orthopaedic surgeons specializing in the treatment of haemophilia, and an acclaimed haematologist, Musculoskeletal Aspects of Haemophilia draws together, within a single volume, all the information needed for the practical treatment of the musculoskeletal complications of haemophilia. A practical 'hands on' guide designed for use on the ward, in the office and at the computer, this book draws on the experience not only of two major centres (Madrid, Spain and London, UK) but also of numerous specialists worldwide. In addition to orthopaedic surgery, it also covers research, rehabilitation and physiotherapy. While of primary interest to the orthopaedic surgeon, rheumatologist, physiatrist and physiotherapist, this book will also be relevant to the haematologist responsible for the care of the haemophiliac patient. Emerito Carlos Rodriguez-Merchan is the editor of Musculoskeletal Aspects of Haemophilia, published by Wiley. Nicholas Goddard is the editor of Musculoskeletal Aspects of Haemophilia, published by Wiley. 1.The diagnosis and management of inherited bleeding disorders. B. White & C. A. Lee. 2. General Principles in Orthopaedic Surgery of Haemophilia. E. C. Rodriguez-Merchan & N. J. Goddard (Spain/UK). 3. Blood-induced joint damage: an overview of musculoskeletal research in haemophilia. G. Roosendaal, H. M. van den Berg, F. P. J. G. Lafeber & J. W. J. Bijlsma. 4. Biomechanical Research in Haemophilia. A. Seuser, T. Wallny, G. Schumpe, H. H. Brackmann & W. J. Ribbans. E. C. Rodriguez-Merchan & N. J. Goddard. E. C. Rodriquez-Merchan & N. J. Goddard. 7. On the Safety of Synoviorthesis in Haemophilia. F. Fernandez-Palazzi & H. A. Caviglia. 8. Intra-articular corticosteroid therapy for haemophilic synovitis of the knee. E. C. Rodriquez-Merchan, A. Villar, M. Quintana Sr & J. Gago. 9. Intra-articular hyaluronic acid for haemophilic arthropathy of the knee. T. Wallny, H. H. Brackmann, H. Semper, L. Perlick, W. Effenberger, L. Hess & A. Seuser. 10. Joint Debridement, Alignment Osteotomy, and Arthrodesis. E. C. Rodriquez-Merchan, M. Ortega-Andreu & G. Alonso-Carro. E. C. Rodriquez-Merchan & J. D. Wiedel. 13. Muscular bleeding, soft-tissue haematomas and pseudotumours. 14. Surgical management of the adult haemopilic blood cyst (pseudotumour). 15. Percutaneous treatment of haemophilic pseudotumours. H. A. Caviglia, F. Fernandez-Palazzi, G. Galatro, R. Perez-Bianco & M. S. Gilbert. 16. The management of giant haemophilic pseudotumours. M. Heim, J. Luboshitz, Y. Amit & U. Martinowitz. 17. Articular contracture of the knee. E. C. Rodriquez-Merchan, M. Blanco, C. Lopez-Cabarcos & A. Villar. H. H. Eickhoff & J. D. Wiedel. 19. Surgical complications in the HIV-positive haemophilia patient. J. L. Hick & W. J. Ribbans. 20. Orthopaedic surgery in haemophilic patients with inhibitors: A review of the literature. E. C. Rodriguez-Merchan & H. de la Corte. M. Quintana Jr, M. Quintanta Sr, & E. C. Rodriguez-Merchan. 22. Osteonecrosis of the Femoral Head. E. C. Rodriguez-Merchan, A. Martinez-Lloreda, M. J. Sanjurjo & V. Jimenez-Yuste. L. Heijnen & M.T. Sohail. 24. Physiotherapy management of haemophilia in children. 25. Physiotherapy for adult patients with haemophilia. 26. Orthotic principles and practice, and shoe adaptations. L. Heijnen & M. Heim. F. Querol-Fuentes, C. Lopez-Cabarcos & J. A. Aznar-Lucea. 28. Burnout syndrome in haemophilia staff. P. Arranz, E. C. Rodriguez-Merchan & F. Hernandez-Navarro. 29. Some discussion essentials for musculoskeletal care and prior to joint replacement. 30. Anti-inflammatory drugs in the management of haemophilic arthropathy: a rhumatologists point of view.